Keep reading for more information about the contents of this issue and for a photograph of oversize wood type displayed on custom-made shelving at Massey College's Bibliography Room at the University of Toronto. DA 78 (Spring 2016) features curator Tom Smart’s ‘Heading to Palookaville’, which considers the complexities of self-identity in the ‘holistic’ artistic practice of Gregory Gallant AKA Seth, who is at once an artist, author and cultural commentator, as well as one of the foremost graphic novelists working today. Smart contends that Seth can also be characterized as a sophisticated performance artist who faces his darkest moments in the guise of a cartoonist and illustrator. Just as the world Seth inhabits echoes the past, so the world he describes in his art resonates with the same voice. Every line, every detail is set down deliberately and with the intention of crafting an artistic reality that is true to what he sees as a period in Canada that existed a generation before he was born. 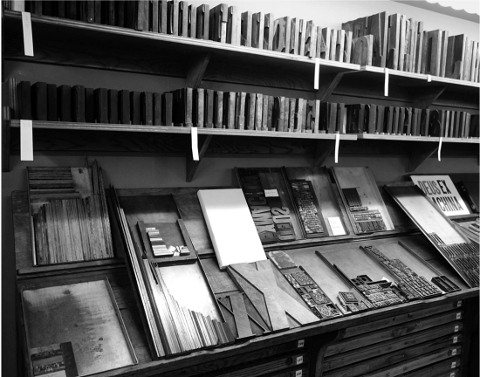 The issue also includes ‘The Story of Thee Hellbox Press’, which originated as a conversation with Hugh Barclay and Faye Batchelor on the origins and anecdotes of the Kingston, Ontario-based private press. Recurring features include Richard Kegler’s discussion of Joseph Blumenthal’s Spiral Type, as well as the Rogues’ Gallery, featuring a profile of Don Taylor. Kandid Kamera showcases scenes from the Bibliography Room at the Rovertson Davies Library, Massey College, University of Toronto. The cover is adapted from a drawing that appeared in Palookaville #22, published by Drawn & Quarterly in April 2015. The keepsake is based on a sketchbook caricature and is printed by Brianna Tosswill at OCAD U on handmade Moriki kozo donated by the Japanese Paper Place. An impressive array of oversize wood type arranged on custom-made plywood shelving. Credit: Don McLeod.